Writing guest posts can be a little scary. Writing on your own blog is easier; it’s your own personal space. But publishing your writing on someone else’s blog for their readers can be intimidating. What if your host blogger dislikes your piece? What if none of her readers comment? Yikes! One reason, of course, is that you are reaching out to new readers that may not have heard of your blog before. Hopefully, you will get some new visitors and maybe even gain some new followers. Another reason is to increase your Google Page Rank by having a link to your blog from another blog, although I just read that Google is using a new search algorithm called Google Panda, which may be more important than PageRank. Don’t ask me to explain it, I’m just telling you what I read! The best reason to write a guest post, however, is because it’s fun! It builds a sense of community among us bloggers and keeps us writing! If you want to write a guest post for someone, advertise that you’re able and willing! Use social media to tell others you would like to write for their website. Keep your eyes open; look for others who need guest posts. Someone who is expecting a baby or is about to travel may want some guest posts scheduled for her blog. Be sure you have your email address readily available on your site so that it is easy to contact you. Some places to start looking for guest posting opportunities is in the SITS forum. (The SITS Girls is a great blog support community.) When I recently went on vacation, I lined up some wonderful guest bloggers through various communities I am active in at BlogFrog. The more involved you are in a blogging community, the easier it is to become a guest blogger! When someone contacts me about writing a guest post, before I give them an answer, I look at their website. Is it similar to my own website? What kind of writing does that blogger do? I look to see what topic that blogger focuses on, and try to go along with that theme. For example, one of my first guest posts was on The Motherhood Muse. Kimberly, founder of The Motherhood Muse, loves the outdoors and lived for a couple of years in the middle of the rainforest. So my post, Cabin Camping, reflects on my love of nature and being outside. Sometimes I’ll get a request to write about something more specific, such as my experiences with breast cancer. I have written about breast cancer many times since it is such a big piece of my past. It would be very easy to just send someone a post I’ve already written. Think of the time I’d save! HOWEVER, I wouldn’t advise doing that. First of all, if I am asked to guest post, I am assuming that the request is for original content. If the content is not original, it can hurt both of your blogs’ SEO. You were probably asked to guest post by someone who has read your blog and knows your writing style. This is why you were asked to write! So even though you may be tempted to write something totally different than your usual thing, stick with what you know. Even if you are not rigorous about spell check on your own blog, if you are a guest, act like a guest! Put your best foot forward and check for spelling and grammar errors. If your post is full of errors on someone else’s blog, how likely is it that readers will pay a visit to your blog? When I am writing a guest post, I usually have my husband proofread it for me even though he never proofreads the posts I write for Lemon Drop Pie. If you’d like, you can read some of my guest posts by looking on my Guest Post page. Have you written a guest post before? Did you like being a guest? Excellent advice! I recently was asked to do a guest post and I was so nervous lol. This will make a great check list. Great and timely post as I just had someone contact me offering to do a guest post on my blog and was unsure of how to respond. 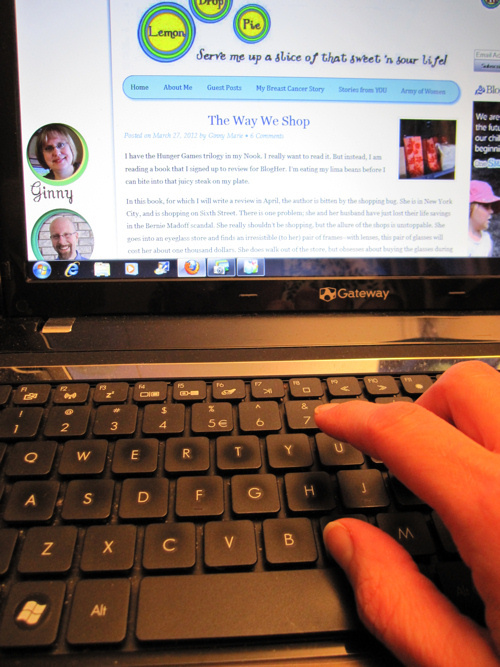 Wonderful tips about writing a guest post, Ginny! You know I still want to blog swap with you 🙂 Looks like you are super busy now. Now that the weather is better we need to get together for a photo session and a blog swap. I have never written a guest post. I feel like my blog is too random and casual for that. My mom writes articles about working from home, so I always send guest post opportunities to her! Great information! Thank you for sharing. I am new to the community (I ran across you on Facebook), and I would love an opportunity to guest post! I would LOVE the opportunity to guest post for you! Love this site, just ran across you through Facebook! And if you'll have me, I'd love to guest post for you! Of course I'll have you, OneMommy! I'll send you an email in a couple of weeks! Thanks for this post, Ginny. Great advice. I'm sorry to say, I've owed you a guest post for like..ever. I'm a bit slow, even on my own blog these days, but I promise to try to get one to you. I just need the house to myself for a day or two. Stacey, I would love a post from you whenever you find the time! I love your writing! I think guest posting is a great idea, because you meet new friends, perhaps pick up new followers, and find new blogs. Even for the readers, it's great because they see something different than the normal blog and bloggers and followers are filled with curiosity. By the way, you did a great blog post on my blog. I think there will always be a few comments because most followers are bloggers and they have the same fear that noone will comment. Great post, the advice is helpful. I have only written one guest post, but it was a lot of fun. I hope to do it again. Great advice! I've written a couple of guest posts and it's so true, it is a bit scary for the exact reasons you mentioned. If truth be told I breathed a sigh of relief each time when there were a few comments left. I did enjoy being a guest, but also did find it more stressful because I wanted to put my best foot forward for someone else. I've only had a couple of guest posts on my own blog and have been thinking of having another soon. Thanks for the tips. I especially like the English teacher one. No surprise there I guess!